View your team's work with Team Planner view. Team Planner view offers project managers greater visibility into, and control over, their team's work. Click on Team Planner menu option. The Team Planner view appears. One row is displayed for each resource in the project. On the left, resource names appear. All of the tasks that a resource is assigned to, appear on the same row on the right. Resource tasks that don't have a start date or end date also appear on the left next to the resource name. 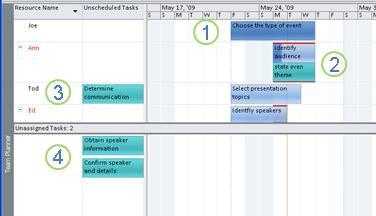 The top task is automatically scheduled and partially completed (indicated by the color change on the bar). The bottom task is manually scheduled. Both are scheduled at the same time to the same person. The resulting overallocation is indicated by red lines. This task is assigned to a specific person, but it doesn't have enough scheduling information to become a scheduled task. This task has not been assigned to anyone. Tip The color of the task gives you useful information about its scheduling state. For example, portions of bar that are dark blue indicate actual work. Green tasks are manually scheduled. You can navigate through items in Team Planner using the arrows keys. To scroll the view, use ALT + arrow. Hover over a task to read important and useful information about how it is being schedule. You'll find that the old familiar tooltips have been greatly expanded to help you make important scheduling decisions. Use the Zoom options to change how much time is displayed in the right side of the view. Right click in a blank area of the right side of the view (not on a task), and then click Nonworking Time.